ContactTalk allows you to capture lead from emails and automatically build an opt-In contact database for the purpose of automatic autoresponder message follow-up. Email leads, or any other consistently formatted email, can be automatically imported and mapped creating each contact automatically and adding them to multiple campaigns which will then automatically send them pre-defined emails or voice messages in response to their inquiries. You can customize and create your own forms with ease using the Visual Form Designer. ContactTalk can easily integrate with VoIP and Skype to cost effectively leverage the internet to make and receive calls. Integrating VoIP with CRM gives customer-facing companies a comprehensive picture of the client, enabling highly efficient and customized service. Personalize each message for the intended recipient with realistic human sounding text to speech (TTS). ContactTalk is an Interactive Voice Responder with Speech Recognition, Text to Speech (TTS), and voice broadcasting capabilities including speech recognition. You can schedule voice broadcasts to execute on an Individual Contact or Groups of Contacts based on any criteria defined by you. These messages can be personalized using tags from the database such as FirstName. These personal messages can be created using Text to Speech or even using your own voice recording. ContactTalk is a Full Featured Scheduler/Calendar with ability to Interact with Contacts or Groups of Contacts and capable of running Multiple Schedules at once. 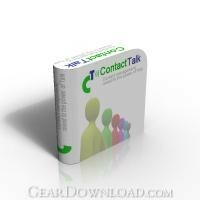 This download (contacttalk-standard-install.exe) was tested thoroughly and was found 100% clean. Click "Report Spyware" link on the top if you found this software contains any form of malware, including but not limited to: spyware, viruses, trojans and backdoors.